I contemplated how I wanted to tackle this post before I even shot the photos for it. 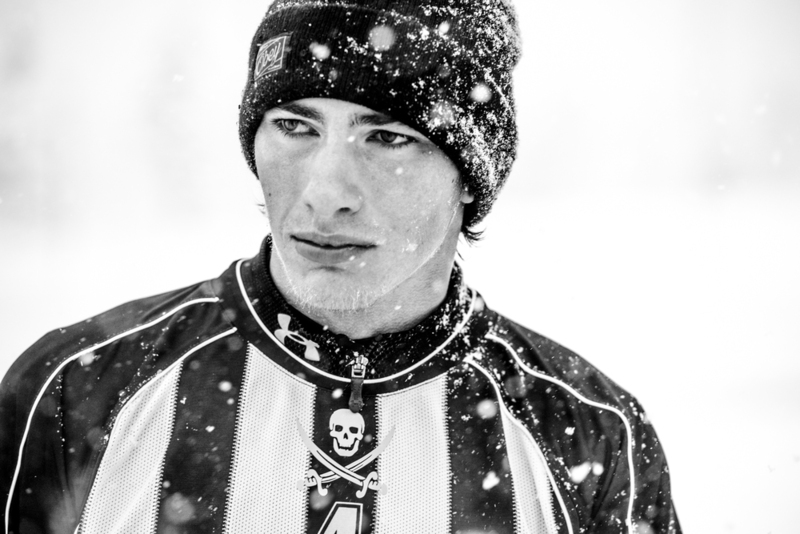 Did I want to share tips for shooting in bad weather; I knew it was going to be rough. 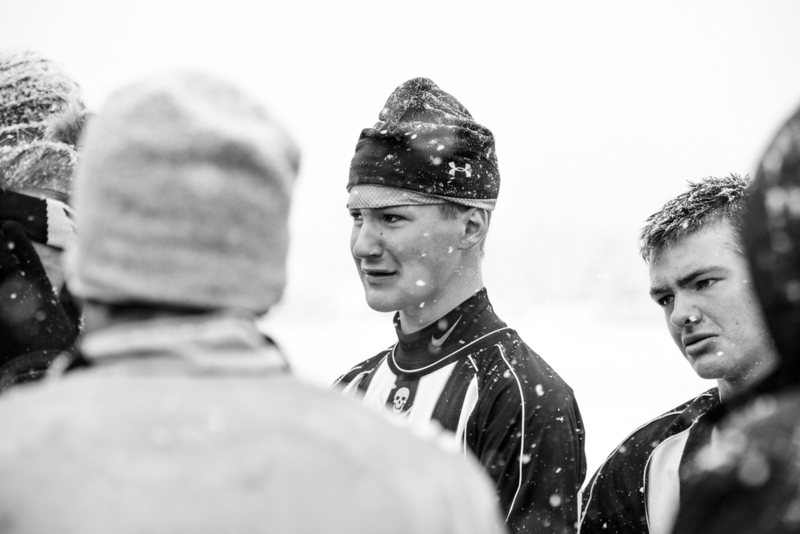 Did I want to share some tips on sports photos; after all, that's a lot of what I do. Did I want to just a do a recap of the game; if I got great shots that would be easy. As I made my way through the images this morning I changed my mind and decided to veer off those tracks based on the emotional images in front of me. 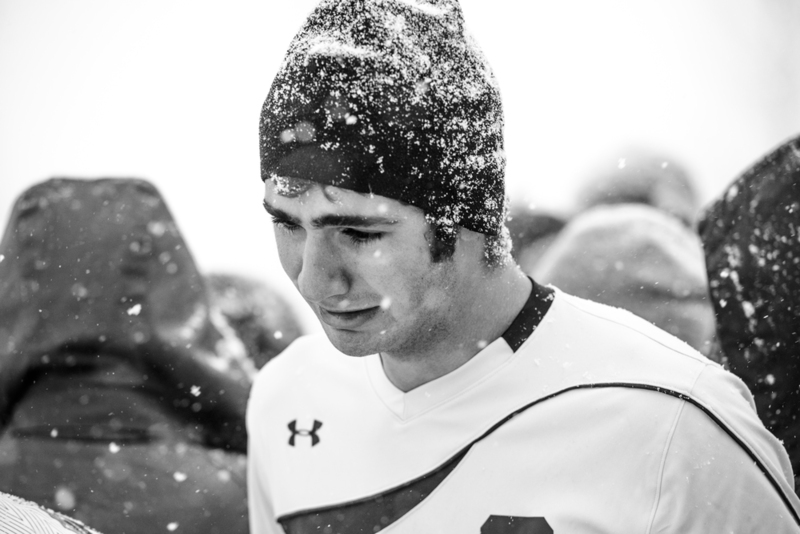 Seniors James Berndt and Blake Irons experience the only defeat of their final season. I had not reviewed any of the images during Friday's game, or even that day other than to post a couple game shoots to facebook and instagram. As I worked through the images, I worked each in black and white to adjust the tone and contrast before making any adjustments to the color. 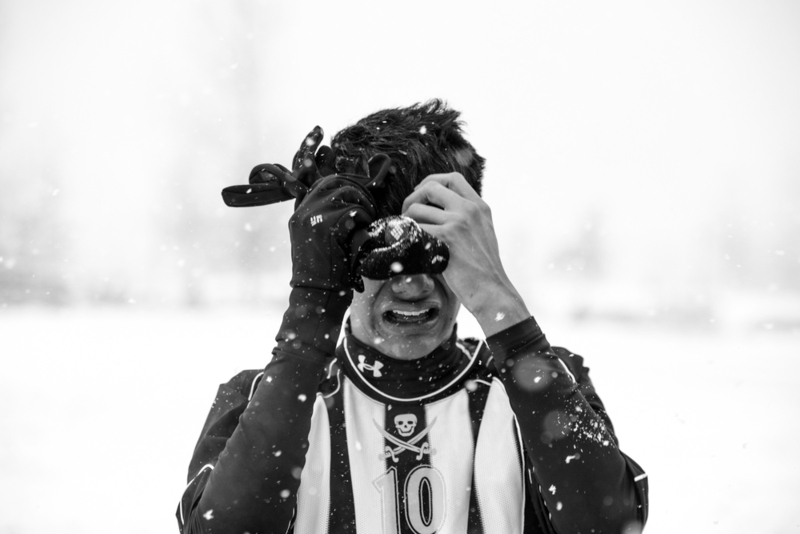 With all of the elements: the black and white jerseys, the weather, the emotion; I knew these pictures were meant to be black and white. Especially the ones taken after the game. To set the scene a little... 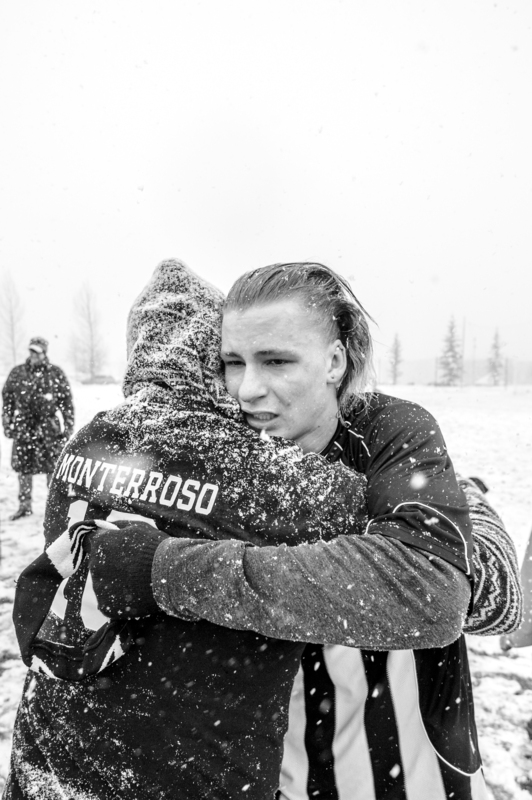 The Pagosa Springs Pirates played to the first undefeated regular season in school history, then defeated two more teams in the state playoffs — something no other team had accomplished in the program's history. 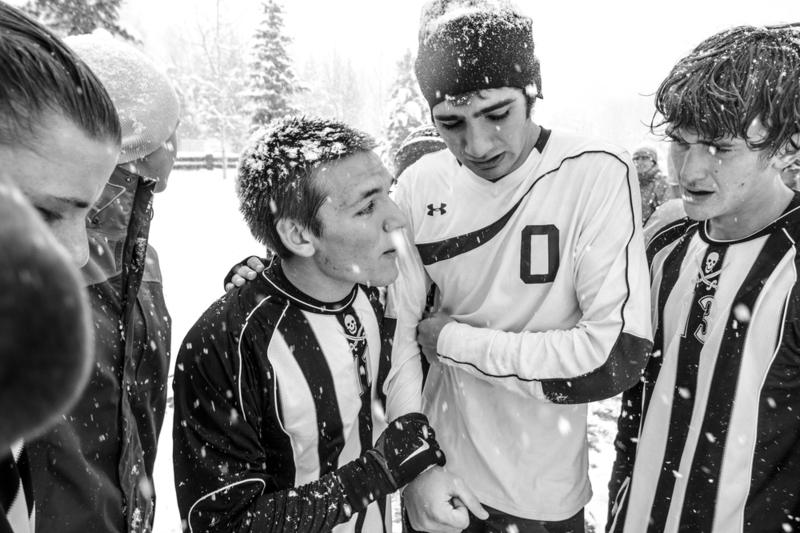 Advancing to the state quarter-finals, the team faced the Gore Rangers from Vail in Vail, CO. 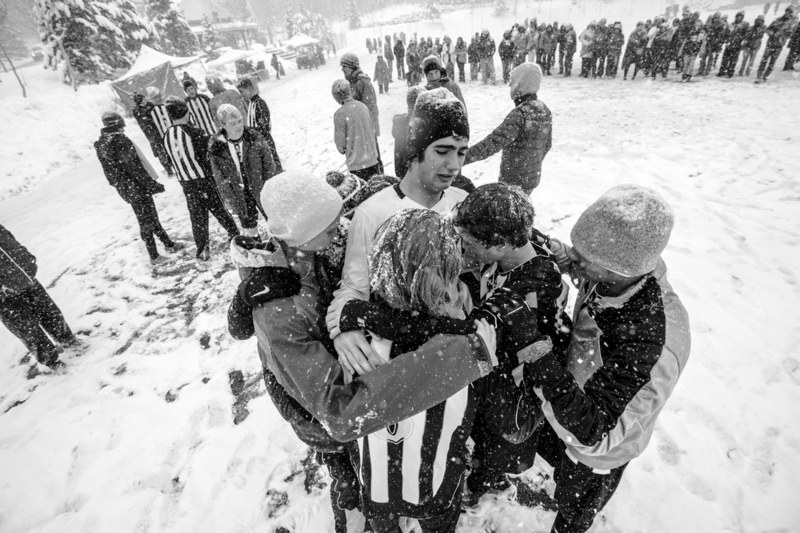 The weather forecast for Vail changed almost daily, but there was little doubt in anyone's mind that the weather wouldn't be great for the match between the number 4 and 5 seeds in the state. As I made the drive up from Denver, the clouds grew darker and darker, the roads wetter and icier. When I arrived at the field it was snowing and volunteers were working to clear the lines on artificial turf field so that the referees could try to make calls. 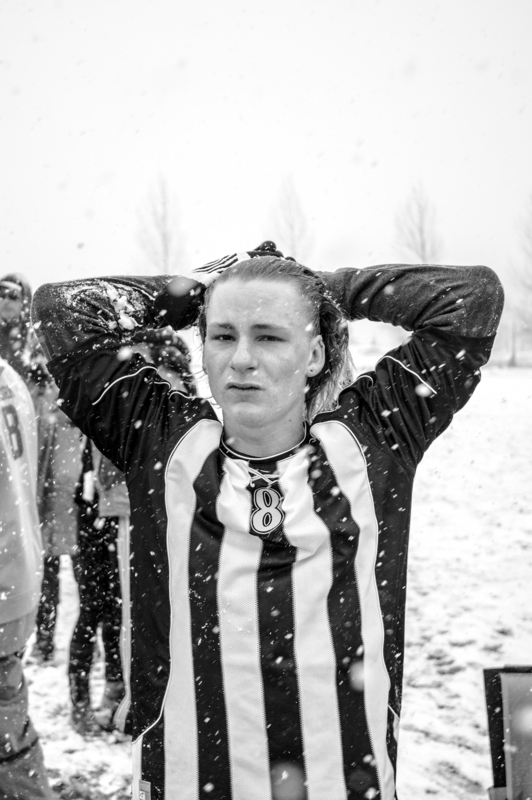 The game itself was cold, wet and windy. 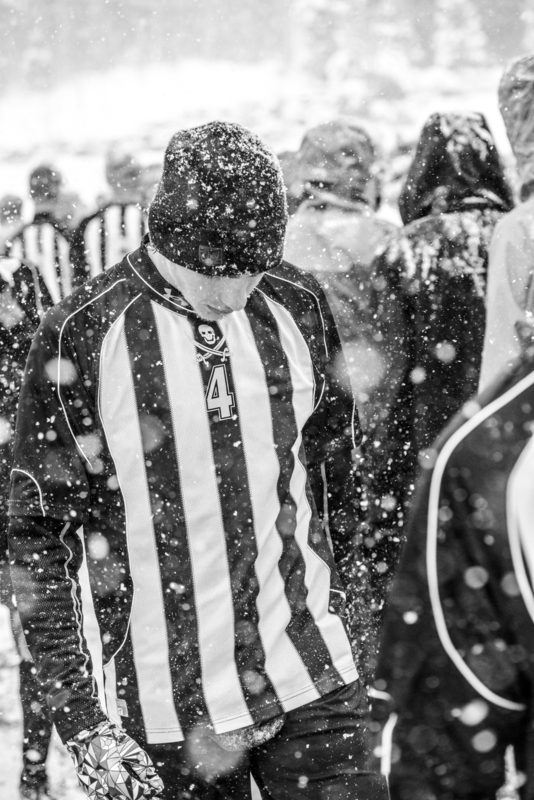 I constantly worked to keep my lenses and bodies from freezing up as periods of the game were in near white-out conditions. In a back-and-forth match that pitted very evenly matched teams, Vail managed to score on a set-piece free kick just minutes before halftime. Pagosa played stronger in the second half, nearly scoring with 4 minutes remaining, but an amazing save by Vail's keeper stopped Pagosa's hope for overtime. 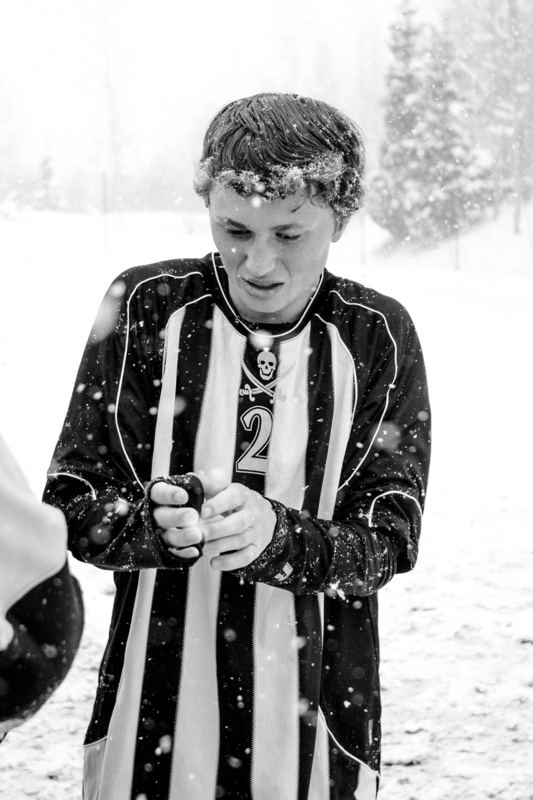 Both teams battled the conditions, as Pagosa's fast pace attack was slowed down to Vail's advantage. 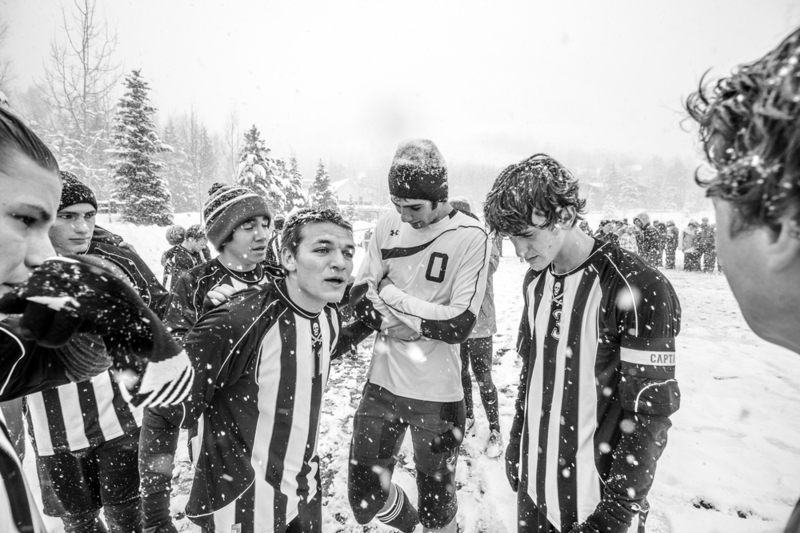 As the game clock ticked down to zero, and the referee's final whistle blew, I searched for Pagosa's senior players in my lens. I knew the exact feeling they were about to experience, because I've been there myself. I played for the same school, for the same coach, on the same fields. It's a feeling that almost every student-athlete has to face. It was their final game and it ended in defeat. All of the youth and summer leagues, all of the long bus trips, all of the ladders and sprints, all of the practices, and all of the pasta nights came down to this conclusion. 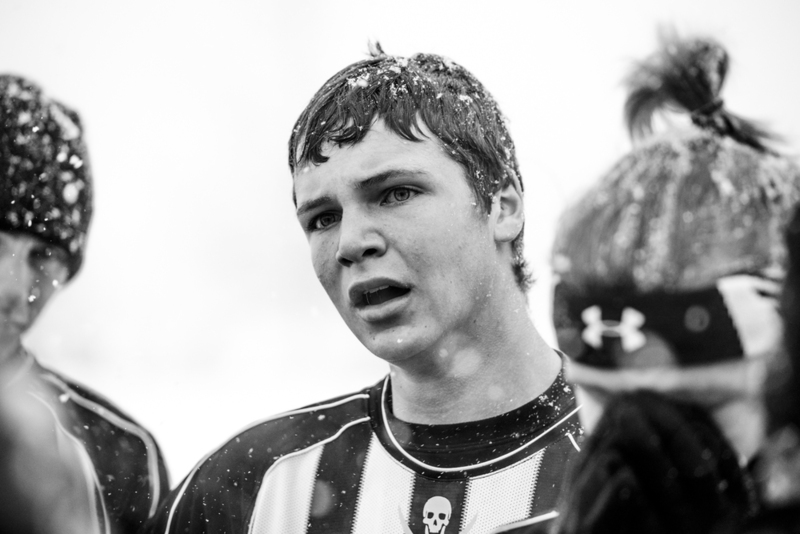 Without a doubt, I know that those senior players have questioned every minute of that game. What if I had done this instead of that? What would have happened if I had cut left instead of right? What if it wasn't snowing? What if we'd played on our field? Did I do everything I could? 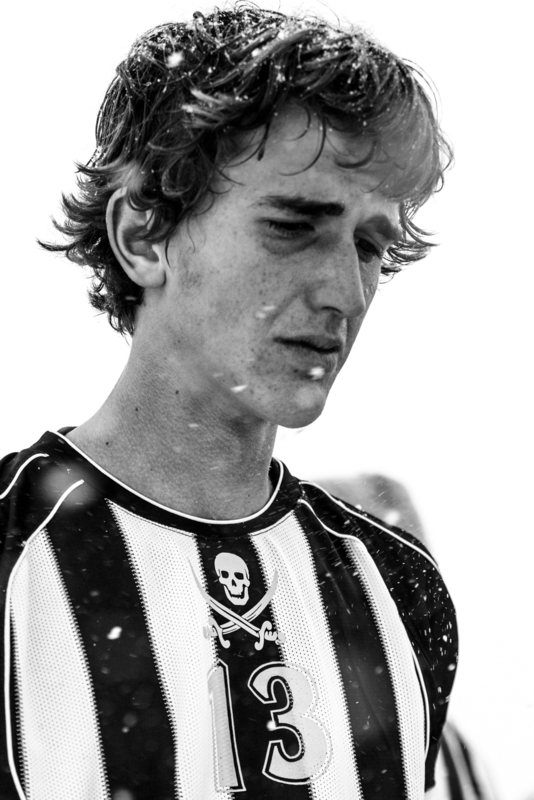 I asked myself those same things as I fell to my knees in tears after my final game, a playoff loss. At that time I was one of two seniors on the team. 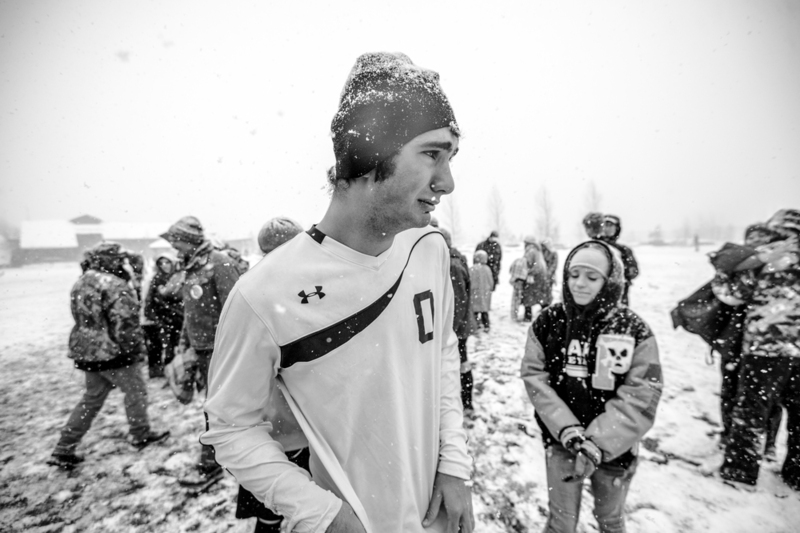 The program was young and soccer in Pagosa was still pretty new. This year's team had eight. They will grow to learn how much they accomplished and how many "firsts" they had as a team. 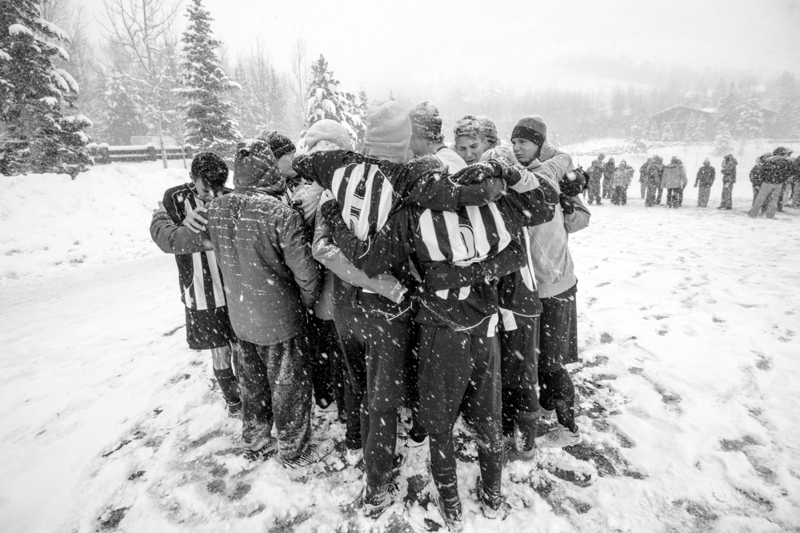 In time they will understand that they continued to build a tradition and foundation for the program, and perhaps in the future they will feel the same pride I do as they see Pagosa soccer teams have success. 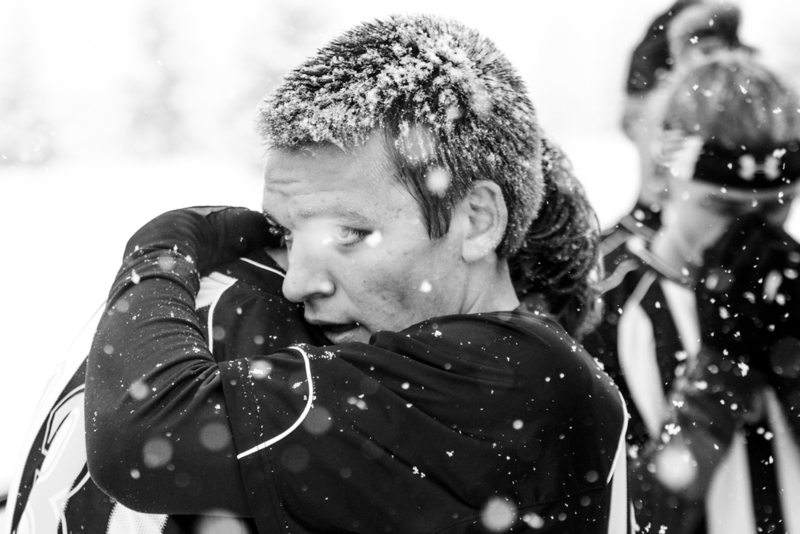 Again, I could share a bunch of shots from the game, showing the intensity, weather and challenge that the team faced. However, I'm going to instead share some of the emotional images that were behind this post. I can only hope that the players and their families see the importance behind these and that they are moved while viewing them. They evoked emotions in me, I hope they do the same for you.